Install a light switch anywhere without running wires. 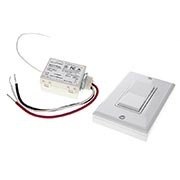 The Basic Wireless Light Switch Kit includes a RF (radio frequency) transmitter that is powered by the press of the switch and can be surface mounted with screws or adhesive. This transmitter sends wireless signals that command the receiver to turn a device off or on. The included receiver is wired between the light fixture and the power source. Great for remodeling projects; log, ICF, and SIP homes; areas where it is difficult to run wires, commercial construction; and redecorating. Contact Green Express Direct for a quotes on quantity pricing. 2.11" x 1.73" x 1.09"
Each package is preprogrammed to work with your switch(es) and receiver(s). If you purchased additional receivers or switches you will have to program them to communicate with each other. This is easy to accomplish and instructions will be included with your order. Always follow local electrical codes when installing this device. If you are unsure about any portion of these instructions, please contact a qualified electrician. The Relay Receiver is wired between the light fixture and the power source. WARNING: To avoid fire, shock, or death, TURN OFF POWER at circuit breaker or fuse and verify that it is OFF before installation begins. Make sure that it remains OFF until installation is complete. 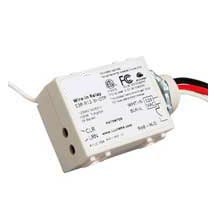 For in-wall mounting, a wiring box must be used. For best performance do not mount the receivers close to the floor or near wall niches. Do not mount the receiver into a metal housing. Prepare wires: Pull off pre-cut insulation from Relay Receiver leads. Verify wires are not frayed; cut if necessary removing 5/8" (1.6 cm) of insulation from each wire. Connect wires. Screw wire nuts on clockwise making sure no bare conductors show below the wire connectors. Secure each connection with electrical tape. Position and stow all wires in the junction box, then restore power. Test the range of the wireless light switch before mounting. 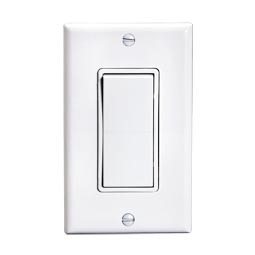 Wireless light switches can be mounted in a standard switch box or surface mounted using screws or adhesive. Approved by: to meet UL Standards. Why is my receiver independently turning ON and OFF? This can occur when an unintended transmitter is activated within the receiver range when the receiver is in Learn Mode. My receiver is not responding to my transmitter command, why? Move the switch closer to the receiver. 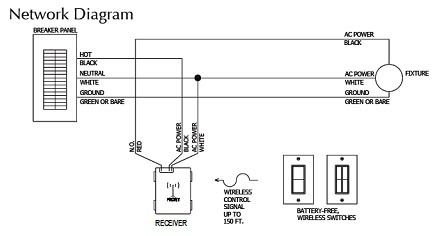 If the system works at closer distance, the transmitter was installed outside the reception range, or there was radio signal interference. Repeaters that extend the coverage range are available; please contact your dealer. Mount the switch or the receiver at a better location. What is the range of my wireless connectors? Masonry 65 ft. (20m), through 3 walls max. Reinforced concrete 32 ft. (10m), through 1 wall / ceiling max. Wood walls / drywalls 98 ft. (30m), through 5 walls max. How can I reprogram my devices? Contact customer service at (877)433-7763.